A renowned Magento trainer, he knows this complicated platform inside out, and makes a living by sharing useful knowledge about Magento with others. He - is Ryan Street, our today’s interviewee. We asked Ryan to share some of his rich eCommerce experience with our readers, and being a true gentlemen, he said “yes”. 1. 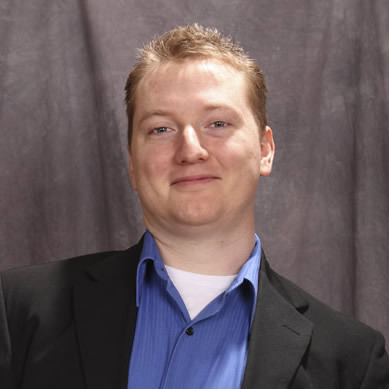 Ryan, you’re a Magento trainer and a talented web-developer with lots of experience. What reasons made you choose such a career path? Tell us your story. I love open source! I love the idea that there are platforms out there that can be used, reused, and improved by anyone who is willing. I love that spirit of community and giving. When I started developing in high school, there were not any programs available for people to learn about web development. This was mostly because it was so new. I looked into a few courses and programs in college, but none of them really went the “open source” route. They were mostly just a repurpose of a generic computer science class. This means they were in ASP or Java. I wanted to learn and do more with PHP and the LAMP stack, so I was on my own. I taught myself about development through online resources and books available for the language. If it were not for these resources, I would’ve been lost. It is because of these resources that I write on my own blog today. It is my way to give back. I started getting into WordPress around version 2.3. Shortcodes weren’t even available yet! I hacked around the code over and over and helped out in online forums to others. WordPress became Joomla! Joomla! became Drupal. I tinkered in others as well. After that, job after job started rolling in. Working on WordPress and Ecommerce implementations through WooCommerce, I discovered another Ecommerce platform that was starting to gain traction. It was Magento. My first project was to sync EBay and Magento inventory. (By the way, I’m sure that old code is hideous!) I had never seen a platform written in such a way before. I was hooked. I got a job at a professional services company working with Magento and the rest is history. I have been working with Magento full time ever since. 2. Now, that you teach people about the Magento shopping cart, you know all the common challenges that both starting developers and online merchants face when dealing with the platform. So, what are they? The first thing I would tell anyone is HAVE PATIENCE. Magento is a very complicated and robust system. You are not going to figure it out in one afternoon. I see many people thinking they can do this. They are the ones who read 3 articles and try to take the certification ☺ You will get through it, but you need to bang your head against the keyboard a few times. It can be frustrating, but you need to put in the proverbial ‘wrench time’ to get a full understanding of the system. Rome wasn’t built in a day, and neither was Magento. You are not going to know your way around without digging in there! The second thing I would tell anyone is KNOW THE MAGENTO WAY. Magento is extremely flexible. This means that there are multiple ways to technically solve a problem inside of Magento. The problem is, if you don’t do things the way Magento intended for them to be done, you will more than likely find yourself in a world of hurt. Bad practices will not only make your system unstable, but will also make it near impossible to upgrade. You don’t want that. Doing things outside the Magento way can cause problems such as caching issues, performance issues, indexing issues, unusable features, strange and unknown errors, and an overall bad user experience. The third thing I would tell anyone is YOU’RE NOT ALONE! Stuck? Have a problem? Want to know if your way is the Magento way? Ask! The community is one of the best features of this platform. You have a whole world of people willing to help out at a moments’ notice. Sites like the Magento forums, stack exchange, blogs, and twitter can get you answers and get them quickly. Do not be afraid to leverage these mediums. We all did at one point and still do! 3. Magento shopping solution is, by far, the most popular open source e-Commerce platform. However, is it suitable for everybody? Or is there a type of merchants that would do better with some other shopping carts - how do you think? Magento definitely isn’t for everybody. If you are a merchant selling a single item, digital or physical, than maybe a simpler solution, such as a WordPress extension may be better suited. Magento may be overkill for such a small catalog. This way you are not maintaining two platforms to fulfill your online needs. 4. If it wasn’t Magento, which shopping platform would you choose to work with? And why? I would go with WooCommerce or Drupal Commerce. I have a background in both of these CMS platforms before I became a full time Magento developer. They are both great solutions for the small to mid-size merchant. There are far too many implementations and not enough developers to help out. They are robust solutions that offer a familiar interface with some of the biggest CMS solutions online today. 5. Since many merchants want to equip their stores with progressive features they decide to migrate to Magento from other shopping carts. What are your views on the concept of data transfers? Do you consider automated migration services to be a worthy option for those looking to re-platform, or do you prefer some other methods? I have performed dozens of migrations during my time with the Magento platform. No one knows your data better than you (the merchant). There are numerous Magento modules out there that can migrate your data for you. Almost every single one I’ve worked with was worth every penny. Large catalogs need to go with larger Enterprise level migrations. Speed is the name of the game for those migrations. Smaller catalogs can get away with some dataflow profiles and a little tweaking. 6. As the release of Magento 2 is right on the threshold, how will it affect the e-Commerce community, in your opinion? What do you, personally, expect from this long anticipated platform? 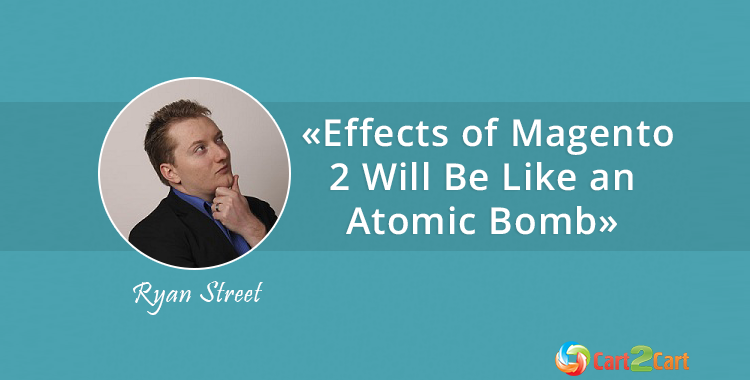 Without being too dramatic, I feel the effects of Magento 2 will be like an atomic bomb. First you will see the flash of it being released. There will be bright light and all kinds of adrenaline everywhere. Then the light will fade and everyone will wait to see what the shockwave will do. No one will move at first, but then they start to hear a rumble in the distance. That rumble will become a roar. That’s when you will see the change rushing up very quickly towards you. That’s when the wave will hit everyone and Magento 2 will completely change the mid-market. Everyone will feel its presence and effects. The headaches that Magento 1 caused have been addressed on all sides. Development stack, merchant features, performance, and much more are all head and shoulders above what’s out there currently. It’s going to be an exciting year! Cart2Cart team would like to thank Ryan for the interview, wish good luck to him and all our followers. Stay tuned to our blog to catch more useful articles and curious insights from e-Commerce experts. Excited about Magento 2? Be sure you’ll be among the first to move your store there, since Cart2Cart will establish its support right after its launch! As for now, don’t lose your chance to enjoy the newest Magento 1.x version, and perform a seamless platform upgrade by moving from Magento to Magento!